All the hedgehogs in the valley gathered together once a year to celebrate “Flower Day”. Each hedgehog was to pick one of their favorite flowers and bring it to the meadow and then there would be a huge parade. All the hedgehogs would get in a line and march around the meadow. Hannah had always been to young to be in the parade, but this year she was old enough. All morning long she danced around her house, singing and giggling with excitement. “Hannah, you need to pick your favorite flower for the parade today,” her mama said. “I am not sure which flower is my favorite. What if I can't decide?” Hannah climbed on her mama's lap. “Why don' t you go outside for a walk and look at all the different flowers. When you've seen them all, then you can make a choice.” Mama put Hannah down and sent her to the front door of the burrow. “Do you know what I did when I had to pick my first flower?” Papa sat down next to her. “What did you do, Papa?” Hannah took his hand. “I picked a dandelion. Every single year I take a dandelion and march through the meadow in the parade. 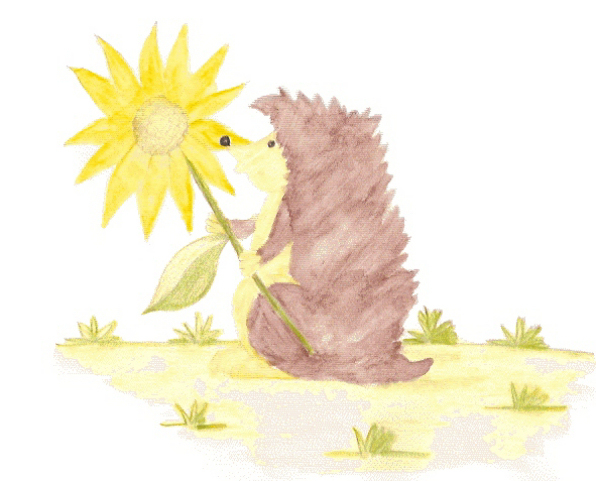 I am the only hedgehog with a dandelion,” Papa said. He patted her head and left her sitting there to think about it. That day Hannah marched with her mama and papa in the Flower Day parade. Papa carried his dandelion, Mama carried her hyacinth and Hannah carried her sunflower. After the parade, when they went to the Flower Day picnic, Hannah hugged her papa. “This is the best Flower Day I've ever had,” she said and kissed him on the cheek.